“The NSW Government has provided $30,000 funding towards this project under the Knowledge Hub program introduced in 2014. The University of Newcastle and the energy and resources sector have contributed significant funding through the refurbishment of facilities and provision of ongoing administrative support. “With the region’s experience in the energy space, Newcastle is the perfect location for the Launchpad to capitalise on local expertise and world-leading research work. 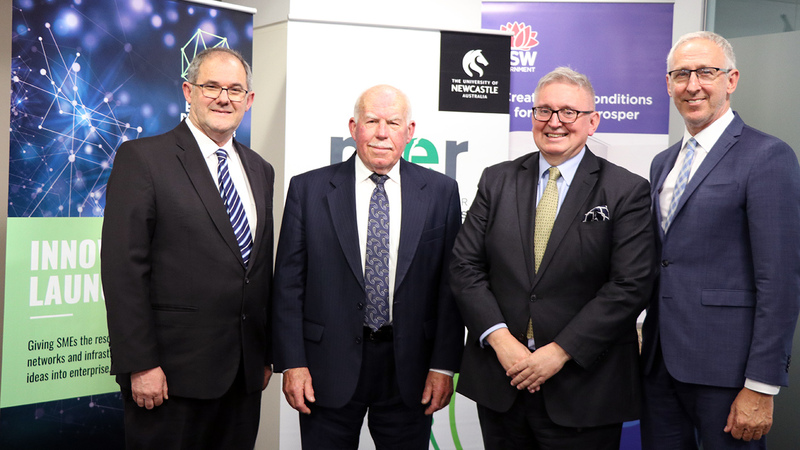 Chair NSW Energy and Resources Knowledge Hub and Executive Director of NIER Professor Alan Broadfoot, Chancellor Mr Paul Jeans, Minister for Resources and Energy Don Harwin and Senior Deputy Vice Chancellor and Vice President - Global Engagement and Partnerships Professor Kevin Hall.